There has been a number of improvements in the way Host screens are defined in NetPhantom. Before, it was somewhat difficult to work with small identification marks. For small resizable marks, the non-corner anchors have been removed. This allows for a bigger "target area" for the mouse. Still, the mark can be resized in all directions. For bigger marks, the standard eight-anchor indication is used. The target area for moving the marks on the host screen was before only the edges of the mark. The new type of marks can be selected for moving everywhere except for the anchors. Creating the mark which correstpond to a host field can be done by mouse dragging but it is also possible to select an underlying host field directly. This is done my either doing alt-click (Alt key pressed and click) or double-click in a host field. The rectangle will now have the size and position as the underlying field. A column can be selected very easily by pressing the alt-key and dragging the mouse in the column. The mark will then be assuming the width and position of the column and only be sizable in height. In host screens where fields are close together it can be difficult to mark fields - if a part of another field is under or close to the area you want to mark, the move/size function will prevent the new mark to be created. In order to lock the editor in "new mark definition mode", simply press the ctrl-key and use the mouse as no other marks were present. Once a field is created, the properties of the field can be defined. The type of the field is fetched from the host screen and the name is a given identifier used to connect panel components to the host field. The other properties are used as input when handling the data in runtime. 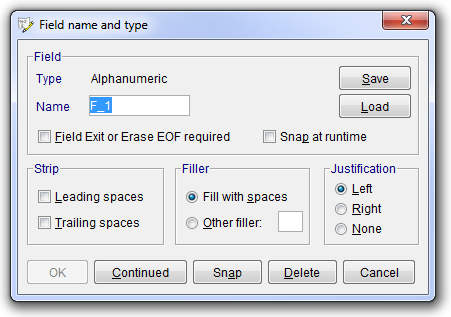 To accelerate the process of identifying host fields, the Save/Load function can be used. When a field which common for many fields is done, this can be saved and later loaded when the next field is to be defined. This means that all the data used for the first template field is loaded as a single action. The two properties which are not loaded are Type and Name, for obvious reasons.